Born in 1936 in Valera, Venezuela. He studied at the School of Fine Art in Valencia, Venezuela. He made abstract sculptures from recuperated metal. In the 50s, he studied at the University of Caracas. He entered the university to study literature, but he arranged to have access to the metal workshop at nights and on the weekends. He concentrated on making abstract sculptures that are notably a series of chrome-plated mobile half-spheres that were exposed at Studio Actual in Caracas. After that, thanks to a scholarship, he moved to France where he chose to study Fine Art at the University of Vincennes. In collaboration with an Italian workman, he created a series of geometric sculptures in Plexiglass that were exhibited in Switzerland in 1972. He also participated in an exhibition at the Venezuelan Embassy in Paris with Cruz-Diez. He then created the famous mobiles where, by means of an engine system, black and white horizontal and vertical lines are moved on a black background. Then the optical movement replaces the engines at the same time that the black and white gives place to the color. It is the period of the Prochromatic: colored verticals at the front of which are placed fine iron rods that are supposed to materialize the vanishing points. The Dynamic Chromatic series is a new decisive step since it fractures the painted space. The work is composed by several geometric pieces (canvas mounted on wooden forms). Most of the time, a central rectangle surrounded by two triangles. A painting that invites the sculpture where the fragmentation and the resulting voids allows the work to be more integrated with the wall that supports it. Moreover, these ruptures integrates and gives rhythm to the optical vibrations at the same time. 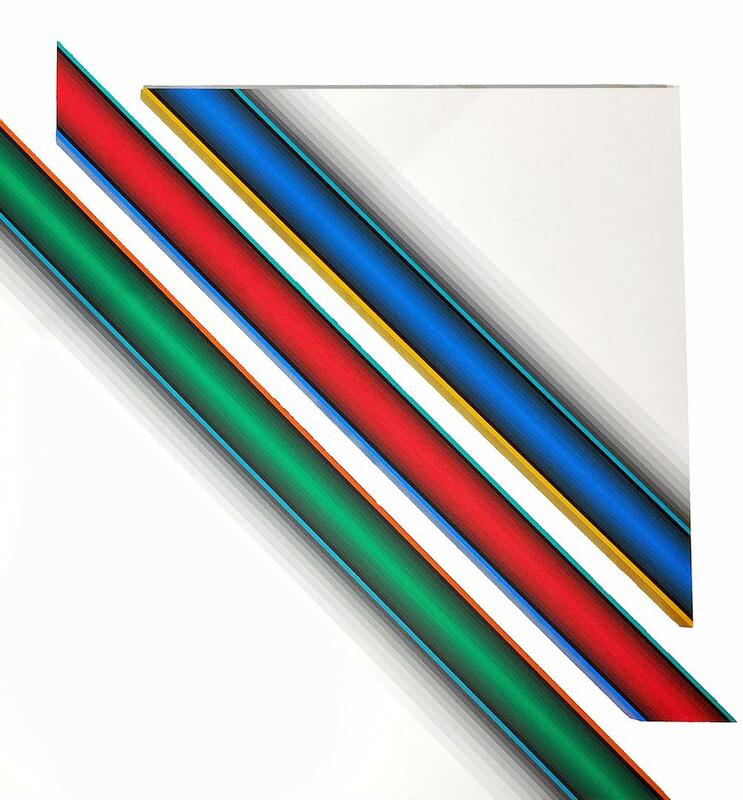 The last works in his series show an evolution: even if his works are still radically geometric, they tend to show a certain de-materialization, causing the color and vibrations to float. Winner of important prizes such as the Orden Arturo Michelena in Valencia, Venezuela, Perez-Flores is widely exhibited in Venezuela and France. His works are represented in prestigious public and private collections around the world such as the Museo de Bellas Artes in Caracas, Venezuela, the Museum of Modern Art of the City of Paris, the Apollo Center in Lausanne, Switzerland and the Kunzeslau and Waldenbuch Museums in Germany.